Major language: English (Look out for Lewis the Lion’s American English page). Climate: The USA is such a large country that its climate varies from the humid continental north to the subtropical south. When Lewis the Lion was in California, he realised that the climate changed according to whether he was at the coast or on high ground. Even in the city of San Francisco, Lewis the Lion discovered a whole range of weathers from cold and foggy to hot and sunny. The East Coast of America on the other hand can be particularly prone to hurricanes that sweep up through the Caribbean. – There are 50 states in America. Lewis the Lion felt that they were almost like their own countries they were so big! 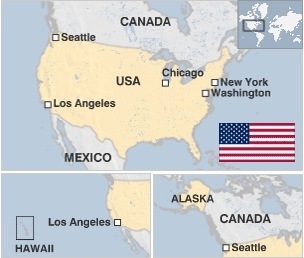 He discovered that two of the States are not attached to the mainland, Hawaii and Alaska: Hawaii is in the Southern Hemisphere and Alaska in the Northern Hemisphere respectively. – America is the world’s biggest economic and military power, with a huge global reach. – America is a multi-cultural country as it has had waves of immigration over the centuries with people coming in search of the “American Dream.” In particular the English, Chinese, Italians and Irish. Today, the main groups of immigrants are Asians from the Pacific Rim and Hispanics from Latin America. (Spanish and Chinese are spoken quite widely throughout America for instance). Although, even before these mass immigrations, there were the Native Americans, some of whom are still there today. (Look out for Lewis the Lion Loves Languages page for when he meets a Native American!). America has quite a dark history with its involvement in the African slave-trade which was abolished in 1777. Race-relations continued to be an issue but it was only in 1964 when the Civil Rights Act came to pass and racial segregation was abolished, influenced particularly by the peaceful protest led by Martin Luther King. – President Obama, the current president, is the 44th President of America. This was a defining moment in American history in 2008 as he became the first ever African-American president. – Some US Presidents had unusual careers before going into politics. Jimmy Carter, the 39th President, was a peanut farmer. The next President was Ronald Reagan who was a famous film actor. – The “teddy bear” was named after President Theodore “Teddy” Roosevelt after he refused to shoot a bear cub when out on a hunting trip in 1902. (Luckily for Lewis the Lion he didn’t spot any bears on his visit to Yosemite National Park but you can find out more on his forthcoming blog!). – America has a huge entertainment industry: television, Hollywood films and music. (Lewis will share some of that history with you when he shares his blog on his visit to Hollywood in Los Angeles). – Like in lots of other countries around the world, traffic flows on the right hand side of the road. Pedestrian crossings often have a count down to help you cross the road in time. – The state of California, on the West Coast of America is called ‘The Sunshine State’ and is so big that it is larger than 85 of the world’s smaller nations. – The most diverse environment in the world is found in the state of California. – All modern trees are descendants of California’s state tree, the redwood and Lewis the Lion had never seen such tall trees in his whole life! – The Golden Gate Bridge in San Francisco has enough steel wire in the cables to circle the earth’s equator 3.5 times. 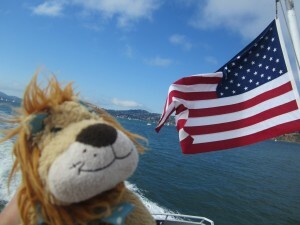 (Look out for Lewis the Lion’s special blog on his cycle ride across the Golden Gate Bridge).